Astronomers have measured a superstorm for the first time in the atmosphere of an exoplanet, the well-studied "hot Jupiter" HD209458b. The very high-precision observations of carbon monoxide gas show that it is streaming at enormous speed from the extremely hot day side to the cooler night side of the planet. The observations also allow another exciting "first" -- measuring the orbital speed of the exoplanet itself, providing a direct determination of its mass. The results appear this week in the journal Nature. "HD209458b is definitely not a place for the faint-hearted. By studying the poisonous carbon monoxide gas with great accuracy we found evidence for a super wind, blowing at a speed of 5000 to 10 000 km per hour," says Ignas Snellen, who led the team of astronomers. HD209458b is an exoplanet of about 60% the mass of Jupiter orbiting a solar-like star located 150 light-years from Earth towards the constellation of Pegasus (the Winged Horse). Circling at a distance of only one twentieth the Sun-Earth distance, the planet is heated intensely by its parent star, and has a surface temperature of about 1000 degrees Celsius on the hot side. But as the planet always has the same side to its star, one side is very hot, while the other is much cooler. "On Earth, big temperature differences inevitably lead to fierce winds, and as our new measurements reveal, the situation is no different on HD209458b," says team member Simon Albrecht. HD209458b was the first exoplanet to be found transiting: every 3.5 days the planet moves in front of its host star, blocking a small portion of the starlight during a three-hour period. During such an event a tiny fraction of the starlight filters through the planet's atmosphere, leaving an imprint. A team of astronomers from the Leiden University, the Netherlands Institute for Space Research (SRON), and MIT in the United States, have used ESO's Very Large Telescope and its powerful CRIRES spectrograph to detect and analyse these faint fingerprints, observing the planet for about five hours, as it passed in front of its star. "CRIRES is the only instrument in the world that can deliver spectra that are sharp enough to determine the position of the carbon monoxide lines at a precision of 1 part in 100 000," says another team member Remco de Kok. "This high precision allows us to measure the velocity of the carbon monoxide gas for the first time using the Doppler effect." Astronomers have measured a superstorm for the first time in the atmosphere of an exoplanet, the well-studied “hot Jupiter” HD209458b. The very high-precision observations of the carbon monoxide gas show that it is streaming at enormous speed from the extremely hot day side to the cooler night side of the planet. 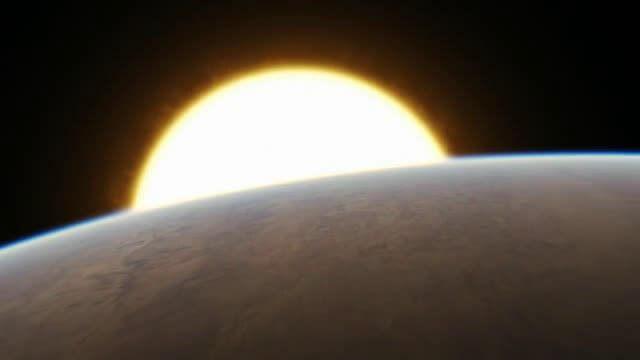 This video shows an artist’s impression of the Jupiter-like transiting planet around its solar-like host star. The astronomers achieved several other firsts. They directly measured the velocity of the exoplanet as it orbits its home star. "In general, the mass of an exoplanet is determined by measuring the wobble of the star and assuming a mass for the star, according to theory. Here, we have been able to measure the motion of the planet as well, and thus determine both the mass of the star and of the planet," says co-author Ernst de Mooij. 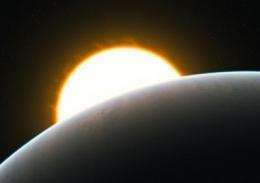 Also for the first time, the astronomers measured how much carbon is present in the atmosphere of this planet. "It seems that H209458b is actually as carbon-rich as Jupiter and Saturn. This could indicate that it was formed in the same way," says Snellen. "In the future, astronomers may be able to use this type of observation to study the atmospheres of Earth-like planets, to determine whether life also exists elsewhere in the Universe."